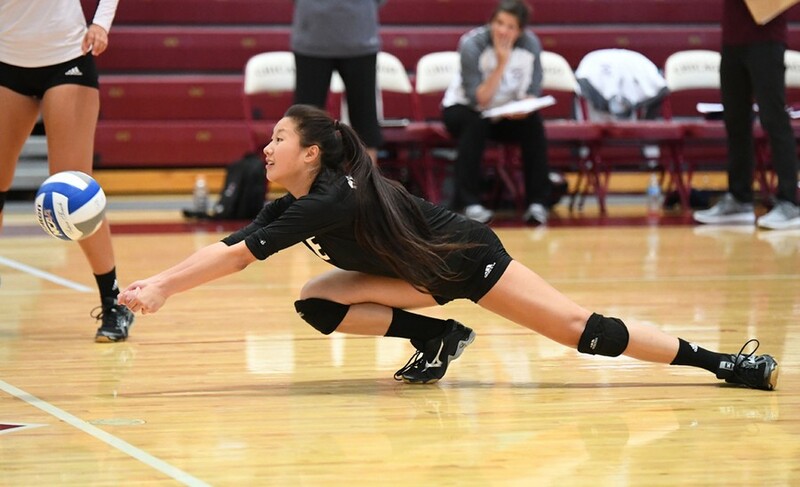 Outside hitter Jessica wang dives for the ball. While many UChicago students were still slaving away at their internships and summer jobs, the Maroons were slaving away on the court, playing 12 of their 26 regular season matches before classes started on Monday. Although the season started out a bit rocky, as Chicago lost three of its first four matches, the squad was able to bounce back, taking seven of their last eight, with the one loss coming in a nail-biter against No. 17 Illinois Wesleyan. First-year Bella Pinton attributes the change to the fact that the team needed to get used to playing games together. “Once we gained experience in a real game setting, everyone started to feel more confident and comfortable, and we began to play at our level of volleyball,” she said. Pinton has certainly contributed to this success, as the outside hitter has posted double digit kills in five of the last six matches and made the Cornell Classic All-Tournament Team this past weekend. Another notable hitter for the Maroons is second-year Audrey Scrafford, who has posted solid numbers throughout the season and earned Carthage Invite All-Tournament Team Honors. As the Maroons move into UAA play, Scrafford will look to replicate her second-team All-UAA and UAA Rookie of the Year finishes from last year. The Maroons will certainly need things to click this weekend at Carnegie Mellon in Pittsburgh, PA with their first UAA Round Robin. They start out against Brandeis on Saturday, but then face two ranked opponents in No. 16 Carnegie and No. 15 Wash U. Although the team has lost both matches they have played against ranked opponents this year, their upward trend may be a sign of great things to come. Pinton certainly seems to think so. “I feel very confident heading into the weekend, especially after coming from a strong performance at the Cornell College Classic,” she said. LaPorte echoed her sentiments, saying, “I think our team energy and talent is there and will continue to help us against our competitive conference opponents.” However, both women emphasized that effort in practice and the strategies that they form later in the week will be key to success this weekend. However, while the squad is focused on winning matches, they are also invested in the development of the team for years to come. Fourth-year Mary Claire Tuohy said on her approach to the game in her final year, “I’m trying to be the best teammate and player I can be.” Tuohy, who leads the team in digs at the all-important libero position, certainly seems to be doing just that. LaPorte agreed. “I try to look at it from my viewpoint as a first-year looking up to those fourth-years and how much they set the groundwork for my experience here,” she said. Chicago will begin its UAA campaign on Saturday at noon as they face Brandeis. Also on Saturday, they will take on No. 16 Carnegie Mellon at 2 p.m., followed by a rivalry match-up against No. 15 Wash U at noon on Sunday.